Explanation: The Perseid Meteor Shower, usually the best meteor shower of the year, will peak late next week. A person watching a clear sky from a dark location might see a bright meteor every minute. These meteors are actually specks of rock that have broken off Comet Swift-Tuttle and continued to orbit the Sun until they vaporize in Earth's atmosphere. 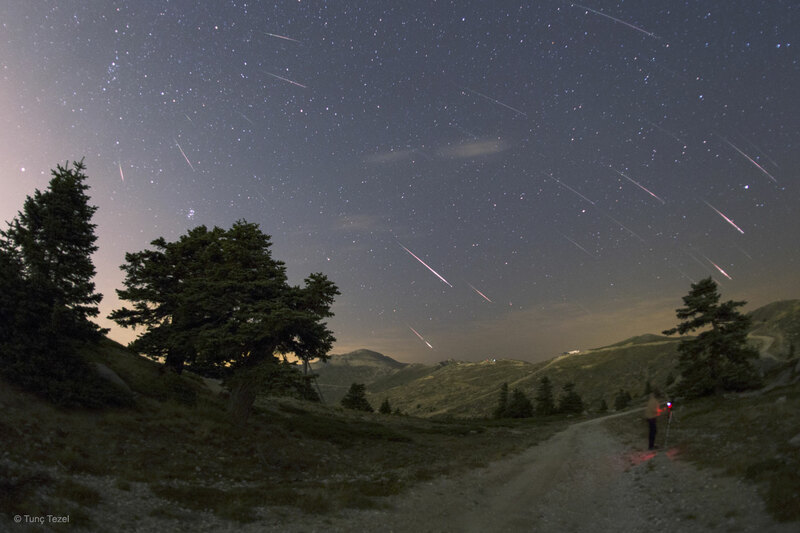 The featured composite image shows a outburst of Perseids as they appeared over Turkey during last year's meteor shower. Enough meteors were captured to trace the shower's radiant back to the constellation of Perseus on the far left. The tail-end of the Perseids will still be going during the total solar eclipse on August 21, creating a rare opportunity for some lucky astrophotographers to image a Perseid meteor during the day.